While he has always maintained a private fine art studio in his home, he has also worked as a graphic artist. In 2006, he came upon the opportunity to teach in the evening at an area creative arts center, which renewed an interest in teaching. He went on to teach adult education art courses at a local community college and then decided he wanted to pursue his master’s degree. Since earning his MFA he has taught courses at the University of Pittsburgh at Bradford, Jamestown Community College and St. Bonaventure University. Rick works mainly in the abstract and his paintings have been figurative as well as non representational. During his time at RIT, his research led him to find ways to integrate his commercial graphic design skills with his love of drawing and painting. He also studied non-toxic printmaking, digital transfer printmaking as well as serigraphy. But what he is known for are his unique woven paintings. This process began in his final days at Clarion University as he was working on a final project in a weaving class. The final assignment was to weave anything he wanted. Being a painter, he chose to cut up two of his figure paintings and weave them together. 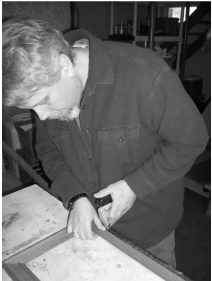 Over the years he has been accepted into numerous juried shows and has won such awards such as Best of Show and People’s Choice. exhibition of new paintings exhibited as part of annual series of featured artists. 2015 PA Wilds Invitational, Crary Art Gallery, Warren, PA.
and faculty exhibition coordinated by Melissa Kuntz. University and Sara Zak, Visual Artist and Community Organizer, Buffalo, NY. Woven, Sewn & Pressed, Dykeman Young Gallery, Jamestown, NY; curated by Debra Eck. Leslie Bellavance and Cynnie Gaash. SAVI Group Exhibition, Cattaraugus County Arts Council, Allegany, NY, group exhibition. 2011 Emerging/Converging, Damon Morey Law Firm, Buffalo, NY; group exhibition juried by Marcus Wise. featuring works by Cattaraugus County Arts Council members, juried by Yu Kanazawa. Hard Work, Joy Gallery, Rochester NY; shared exhibition with Bradley Butler. competition, RIT Professor Keith Howard, curator.